Yeah, I know this is a sewing blog, but I’m wanting to get this off my chest, so feel free to skip the diatribe that follows if you’d prefer. The picture below is me circa 1987, fully convinced that I was ugly and obese because I weighed a horrible 120 pounds. I remember going over the 100 lb mark when I was about 11 years old and drowning in a panic because I was therefore “fat”. I am not, nor ever will be, a Twiggy type. It’s not in my genetic programming! What is it with people these days? Female friends and acquaintances, specifically. Why all the comparisons? Comments? Envy? Self-loathing?Whispered conversations about weight gain or loss, especially around someone a couple of sizes bigger than you? Geez! The first day I wore my Vogue 1250 feather print dress, I got appreciative looks from my husband (who thoroughly enjoyed taking the pictures) and a “compliment” (quoted in the title of this post) from an acquaintance. Just to put the comment in context: The woman is about 15 years older than me, slim, pretty and counts every single calorie she puts into her mouth. Imagine not being able to enjoy a mouthful of something really tasty without thinking that you shouldn’t have the second bite! Yet again, this past week a couple of friends were commiserating with each other about the “battle of the bulge”. They’re both in good health, their children are healthy, they live full lives, and they are very much appreciated by their respective husbands. One is about my height (5 feet 6 inches) and confessed earlier this summer that her physician is concerned about her inability to put on weight because she’s so underweight. Yet she’s complaining about the usual addition of bumps that occur due to multiple childbirths, never mind the general phenomenon called maturing. Ummm….. does the only person that you punish on a daily basis with views of you in your birthday suit or skimpy lingerie complain about the excessive extra pound? Or was that two pounds? “Gee, honey, I hope you don’t take this the wrong way, but you’ve been adding a bit to your circumference lately. I kinda prefer not having my hands so full of you, if you know what I mean. Could you eat less and exercise more?” And if he’s happy with whatever you’ve got for him to look at, who cares what the next person in the room looks like? Is wearing? Is size whatever? Some time ago I picked up an issue of I-don’t-remember-what magazine in a waiting room, but it wasn’t a magazine I do not usually read. Because I was unfamiliar with it, I started with the “Letters to the Editor” section. Most were from men, interestingly enough, and they were about a photo spread on lingerie. No big surprise there. Guys like lingerie. But what did give me pause for thought was that every single letter spoke about how they were glad to see Crystal Renn as the model. Not one letter stated they were disgusted or horrified that they were looking at pictures of a what our weird society calls a “plus size” woman in underwear. There was even a comment about how it’s really ugly looking at the pencils that the magazine usually uses for their shoots, and could they please do more with Ms. Renn, because her curves were eye candy. Interesting. I am so very tired of people obsessing about their bodies. Who cares? Did people walk around 100 years ago comparing each other’s waist measurements? “Oh, Sue, I wish I could lace my corset as tightly as you!” How flat they could make themselves look during the flapper years? “Sarah, you look so beautiful! Tell me your secret! I’d die to look as androgynous as for that party tomorrow night!” How much of the preferred (extremely unhealthy) “S” shape they could acquire in their spine? Good grief! Everyone wanted to look like Marilyn Monroe at some point. Why? If every woman hired a stylist and a great photographer, she could pull off pin-ups like Marilyn. And d’ya think she looked like that 24/7? What about Elizabeth Taylor and her 24-inch waist? Wasn’t that a corset-induced look, too? Heck, when I got married, my waist was 24 inches, and I thought I had a lot of extra blubber hanging around that I worked for years to starve off. Why? Do people really want to look like a piece of dowelling that has breasts smaller than 1/2 a lime and no hips to hang their skirts on? Sure, it’s easier to fit a garment to the “standard” B cup perfect bust-waist-hip ratio body, but is anyone that? I mean, really. It took years to reach the point where I don’t want to look any different than I am, and I owe a lot to the very obvious, often embarrassing, enthusiastic appreciation and enjoyment expressed in my DH’s eyes most days. Can we please just be happy with how we’re shaped? There’s a million options out there for dressing well and looking good; for highlighting what you like about your shape and playing up what you want people to notice the most about you. How about starting with a smile? At the person in the mirror? Thank you for this post. Exactly what I needed! Exactly! I don’t think we’ll ever escape the tyranny of societies’ ideals for our bodies. Just when you are feeling happy and content with yourself someone comes along, or some magazine article, or some reference in pop culture that makes you feel you have no right to be content! How awful! When you look at western art through the centuries the women’s bodies change enormously through the centuries. The men’s ideal, on the other hand, has pretty much been static since the ancient Greeks. For me, that says a lot. I think your jacket looks great btw. Is it the same one that I sewed in Linton tweed? It looks very different in thinner, smoother material, but also good. It’s actually a very nice pattern with lots of fitting opportunities. As a single girl and a feminist I honestly believe that we have to strive to find ourselves beautiful. It’s something of a contradiction to suppose we should be happy with our bodies because our men are happy. I did once have a fascinating discussion with an “intellectual” who was convinced that our “disgust” with excess weight in modern western society reflects our disgust with laziness (we can eat whatever we want so it’s easier to be fat than thin and in control). And I do believe that we associate thin with wealth and fame. It’s not just magazines and celebrity. Studies are showing that low socio-economic families have higher rates of obesity. I think we should stop worrying about our weight as women and as a culture adopt the French/Italian attitude: the time and money a woman spends on grooming (spas, pedicures!) is worth it. I’m tired of seeing women work themselves to the bone feeling guilty because they haven’t had a chance to go to the hairdresser! Thank you TiaDia. I could not agree more, and guard against the infiltration of the “cult of the body” messages. I don’t read fashion magazines, I rarely watch fashion shows and I don’t watch a lot of TV. Yet, when I am at my most vulnerable, I still feel SHAME about my extra weight around my tummy. Where did that feeling come from? It’s maddening. 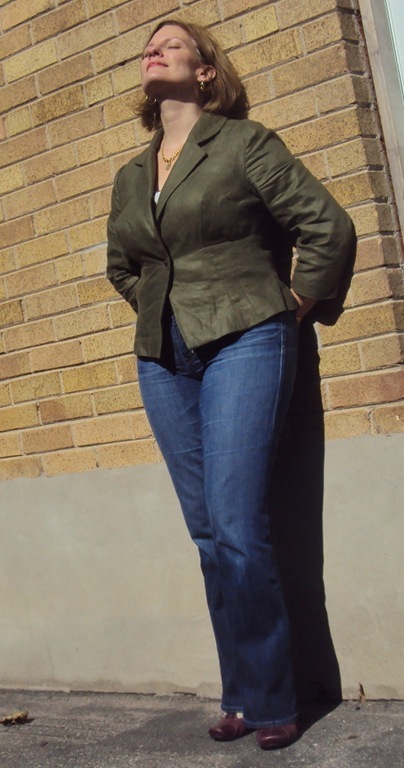 I am an active older woman, and I am strong, healthy and curvaceous. I suspect the vagaries of women’s fashion and beauty ideals over the last (100? 200?300?) years have more to do with competition and status, fed by industries that make money off our insecurities, than they do with appearing genuinely attractive (especially to men). Thanks for this! I don’t know why women insist on being ourselves and each others worst enemies- we need to support ourselves and each other more. 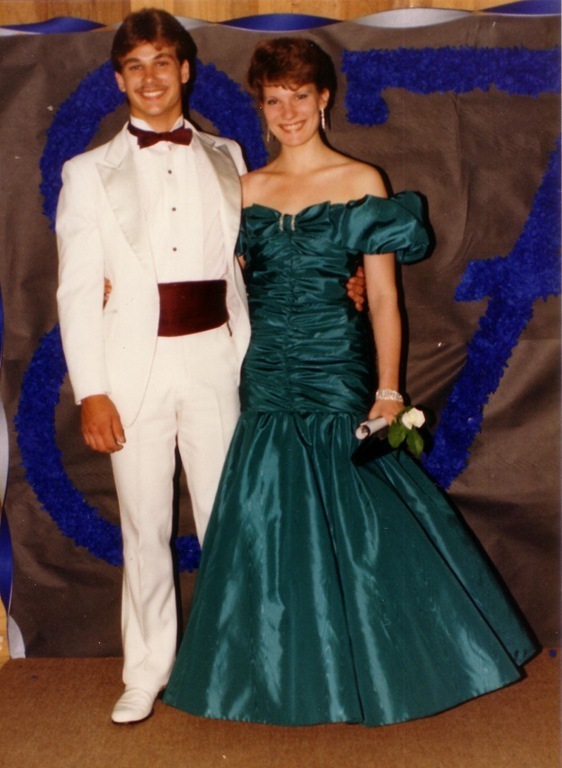 By the by- I would have killed for that prom dress- my little parochial school hadn’t condoned off the shoulder in ’87! Ha ha! Neither had mine! I got into trouble prom night for that off-the -shoulder dress. Thanks to my dad for encouraging me to break the rules (which I wanted to do, anyways! ).